I came across this in a Facebook group I belong to and thought it admirably described the British sense of humour. I figured it might explain a lot to you about the way I write. Up for shares please? Would be sooooo grateful. So, all completed nice and early, pressed publish and then remembered that I’d not added the categories and tags. No problem I thought, I’ll just pop back and edit it. So I did and then I sent out a blog which was only tags and categories. A kind follower alerted me to this so I had to go back and do the whole thing all over again – sigh. So, where were we in SE Asia? Oh yes, on the boat on the Halong Bay in Vietnam and believe me it was pretty cold, being January I guess that was to be expected. I had packed some winter clothes, in fact I was wearing all of them – at once, all at the same time. While DH had a massage down one end of the boat, I tried to relax with a book in our cabin, until I noticed it was getting colder and colder. The damn aircon was on full blast. I fiddled and fiddled with the remote- no luck. I then clambered up and pressed every button in sight, no luck, I tried to unplug it but it refused to cooperate. Finally in desperation, I went for help. The guide failed, the steward failed, the engineer failed and the captain failed. After a long discussion they decided to give us another cabin – the presidential suite. Well this was the life – except you didn’t want to sit down on these chairs, unless you were very well padded. And the bathroom – or more correctly posh heads? When did you see a Jacuzzi this size on a boat? There were, however two small problems. We had been warned that after 8.pm there was no hot water on board. Time now? 8.30pm. I was already cold enough, and the thought of sitting in freezing cold water with even colder jets spraying over me was not too enticing. Also, there were no instructions and we hadn’t the faintest idea what you twiddled, pushed, pulled or thumped to make it work. We settled for admiring the red-brown coloured enamel work. Then problem #2 arrived. Somehow, while using the sink, I managed to get the metal flip stopper stuck in place. There was no way to empty the sink. Frankly I just didn’t have the courage to call for help a second time, so for the rest of the time on board, we had to brush our teeth over the loo. It’s not all fun in these posh places you know. But all was not lost. We visited this pearl farm floating on the water, where they nurture and grow them in little pens and then kill them and wrench the pearls out of them. I passed on the cooking class, as by then I was feeling really ill – from frost bite I thought. But I managed the trip to the fishing village, all on stilts. It was just amazing, set among 2,000 limestone islands but the kayaking, swimming and diving were a little out of the question. If you take a trip there, go in the summer! We shared a boat with these nice people, and as we all remarked, when they get the pics developed we will all be asking “Who the hell were they?” Little did they know it was me! Then it was time for bed, so I popped over the side to take a quick pic of the boat with its lights on. Sadly the little prince died when he was 11 years old, and then his Daddy died, and then Queen Anne herself popped off her mortal coil in – 17 something or other and now parliament was in a fix. No heir? They looked around Europe desperately and began offering current accounts at Barclays, books of green shield stamps, Amex cards and Debenham accounts to anyone who was protestant and would sit on the throne of England. They even threw in a free subscription to Readers Digest. Eventually they had a taker in George who came from somewhere in Germany, only it wasn’t Germany in those days, just a lot of little states and I won’t bother to mention which one as I would probably spell it all wrong. Enter George I and we’ll meet him next week. Once again we rose to the rattling of the alarm clock, had we fooled ourselves into thinking this was a holiday? After more unusual fare for breakfast – raw fish has never been high on my preferred breakfast menu – we were whisked off on a 3 hour road trip towards the coast. The scenery was much as I had seen on the odd television programme, small shops by the side of the road, millions of scooters, often carrying whole families and swathes of rice fields. Suddenly we turned off the road and entered a different world. The potholes had disappeared, the grass verges were neatly trimmed and floral displays abounded. Brand new buildings, retail space on the ground floor, offices or possibly apartments above. Not many were occupied but from a rural third world we were catapulted into the first world by turning a corner. At the end of the road we saw shelters, small offices and the river Halong. Hugging the kerb was a long line of tourist coaches and hugging the river bank a long line of small boats waiting to transport holidaymakers to the larger boats a little way off shore. We were provided with life jackets and catapulted onto a small boat along with our luggage. Why, oh why did I choose to buy a luggage set in white I asked myself. I could mention at this point that it was pretty cold. The sun was shining, but gave us little warmth. I was muffled up to the eyeballs. We climbed aboard our boat, two decks, about 20 cabins and a dining room and a spa. I suppose it could cater for around 50 people, but it was less than half full. Our cabin was very pleasant and we settled in for a night on the water. I just loved the way they described this as checking in to our private cabin – we had not been planning on sharing it with anyone else. Soon we were gliding along, and the scenery was amazing. Tall rocky outcrops rose out of the water and the river stretched as far as the eye could see as we cruised up or down the river, I wasn’t sure which way we were going. We were transferred into a smaller boat and taken into an almost circular cave where, they informed us proudly, Leonardo de Caprio had filmed The Beach. Sad that their high point of tourist info came from the halls of Hollywood, when this World Heritage site was worth seeing simply for its beauty and grandeur. The itinerary mentioned sunbathing and swimming as leisure activities, but certainly not for me, and no one else ventured into the water either. By now I was wearing as many layers of clothes as I had brought. My suitcase was practically empty – I was like a Ryan Air passenger wearing more than I had in my luggage. After dinner, while DH went for a massage, I decided to have a quiet read on the bed and it was then that the trouble started … to be continued. Poor old Anne – well of course she wasn’t poor was she, despite losing vast sums of money at cards and treating her favourite women to wads of cash on a whim. This must have been a particularly long card game as someone painted a portrait while they were at it. But she was beginning to realize that she was not going to have an heir. She’d been almost constantly pregnant since her marriage and one after another after another she either miscarried or the babies only lived for a couple of years until only one son survived. He was a bit strange though, and sickly. As was common in those days posh women didn’t feed their own babies, they called in a wet nurse to do this for them. Enter Mrs Pack a Quaker woman who apparently was well, very well endowed in the milk production area. She saved little William’s life and was thus installed in the nursery. He suffered from hydrocephalus, so his head was out of proportion to his body, but this deformity was not reflected in his portrait, he was spared the vicious truth of the modern selfie. But he was quite bright with a burning interest in military affairs. He recruited 90 young boys, dressed them in uniform and drilled them daily. He even persuaded the king to come and review his troops. It’s just as well he had a big garden to play in. It must have been like the annual dreaded kid’s birthday party with hoards of screaming kids every day of the week. Sensibly, Anne gave him his own house miles away from the court. Have You Ever Wondered How British People Speak? Just in case you need a reminder of how the British speak. Which category do you fell into to? English may be one of the hardest languages to speak, but I often find that it’s the accents of those who speak it that can make it even harder to understand despite being an English speaker myself. Watch this humorous video and discover how people in different parts of Great Britain speak. You may need to log onto my blog to view the video. Sometimes, even the different words us British use to describe something when talking to each other can cause confusion. That’s a post for another day. Do you ever have problems understanding accents? THE RED PARTY TO RULE FAIRYLAND! 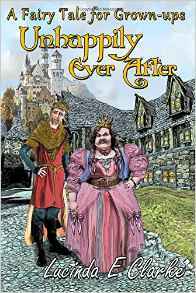 This is the last preview of my new book, Unhappily Ever After. It’s not only here on Earth that we suffer from politics, the Red Party has infiltrated Fairyland as well and the man they chose to carry the message further was the Green Giant. The Giant planned his strategy. Devoted though he was to his job, he’d been well trained in incitement without personal involvement – which briefly translated means you make the bullets and get others to fire them. Never be seen at the forefront of any action, remember the Party needs you, so don’t take any personal risks. He had no intentions of risking his own skin, despite what he preached, he was a coward at heart, so he must find a second-in-command through whom he could manipulate the masses. The way to most peasants’ hearts was through their stomachs, so he lashed out on a dozen boxes of tea bags, four kilos of sugar, a few pints of milk, and offered free mugs of tea to all who would attend a meeting in the old barn by the crossroads at sunset. By mid evening, the barn was filled with a villainous collection of people, garbed in a motley selection of torn and tatty trousers and shirts, some even had boots, most were not so fortunate. The air was filled with expectancy and the odour of human sweat from unwashed bodies. Most of the peasants had never seen a bath, much less a bar of soap. There came the sound of approaching footsteps and a hush fell over the assembly. The steps drew closer, came right to the outer door and then stopped. Those inside stopped breathing, holding themselves rigid, fearful yet excited. There came a loud knocking on the door, three short, three long, three short. The nearest peasant rose and going to the door hesitantly opened it an inch or two. On the threshold stood the Green Giant, dressed in a smart green suit reminiscent of Robin Hood. His shirt was a snowy white, his cap was tall and rose to a point, a feather stuck jauntily in the band. He entered, slowly running his eyes over the assembled crowd, and for a moment a flicker of distaste registered on his face. Then he smiled and throwing his arms wide he stepped into the middle of the room to greet them. An audible sigh ran through the crowd. They weren’t too sure what he was talking about, but he was very impressive. They opened their ears and gave him their full attention. He stood at the front of the room, mounted a hay bale, and raising his arms theatrically, he addressed them. The peasants looked puzzled, they couldn’t remember that happening, and who were the oppressors anyway? What words! What impressive sentences! What rhetoric! What the bloody hell did it all mean? Want to find out what happened? Why not buy the book?